Having a good baseline assessment and thorough history helps to ensure success. The use of scleral lenses in the management of conditions including distorted corneal surface and ocular surface disease (OSD) has grown exponentially within the past decade.1 Having a systematic understanding of a patient’s baseline prior to lens wear, setting proper expectations, and anticipating possible complications are key in maximizing long-term success in a scleral lens practice. This article discusses allergy management in scleral lens wearers. Atopic and vernal conjunctivitis are considered advanced forms of ocular allergies,2,4 with more severe signs and symptoms than those types listed above; as such, these conditions will not be considered in this review. Differential diagnoses for allergic conjunctivitis include infectious conjunctivitis, keratoconjunctivitis sicca (KCS) or dry eye, toxic conjunctivitis, blepharoconjunctivitis, contact lens-induced papillary conjunctivitis (CLPC) or giant papillary conjunctivitis (GPC), and floppy eyelid syndrome (FES).2-5 Although GPC can present in the absence of contact lens (CL) wear, this term is sometimes used synonymously with CLPC in referring to papillary reactions in CL wearers. Complications of scleral lens wear in patients with ocular allergies can include general lens intolerance, edge awareness, ocular discomfort, dry eyes, increased itching, redness, burning or stinging, reduced wear time, increased lens surface deposits, poor front surface wetting, and fogging of vision. A fundamental initial step in proper management of ocular allergies in scleral lens wearers is having a comprehensive understanding of the patient’s baseline. This requires obtaining a complete systemic and ocular history. If the patient has a history of allergies, how are they managed? Is the patient being seen by an allergist? Has the patient had formal allergy testing done in the past? During what time of year is he or she the most symptomatic? Establishing proper care at baseline for patients who are susceptible to manifesting symptoms of ocular allergies is critical. In the absence of adequate systemic management, ocular symptoms and complications with scleral lens wear can be relentless and unwavering. As part of a thorough baseline clinical examination, evert the eyelids to assess the upper tarsal conjunctiva. Lid eversion should be performed at baseline for all patients who are initiating scleral lens wear. If a slit-lamp camera is available, photodocument the patient’s conjunctiva at baseline both in diffuse white light and in blue light after instillation of sodium fluorescein. Clinically, assessing conjunctival morphology using fluorescein and blue light can yield higher severity gradings of papillary roughness compared with assessment using white light (Figure 1).6 Subsequent periodic photodocumentation of the patient’s conjunctiva can be compared against the baseline photos. Figure 1. A 21-year-old male scleral lens wearer with history of allergic conjunctivitis. Slit-lamp photograph of the left upper tarsal conjunctiva upon lid eversion in diffuse white light (A) and wide-beam blue light with yellow filter (B). Note the evident higher degree of papillary roughness of the same eye upon instillation of sodium fluorescein. Be sure to assess the laxity of the eyelids as part of your initial examination. The prevalence of eyelid laxity is significantly higher in patient with keratoconus, the most common corneal ectatic disorder encountered in a specialty lens practice.7 FES is considered a severe form of eyelid laxity, and it is also associated with keratoconus and obstructive sleep apnea.7,8 Both general eyelid laxity and FES can induce papillary conjunctivitis due to the mechanical insult of the conjunctiva, which is worsened in scleral lens wear and can mimic ocular allergies. Figure 2. A 49-year-old man with history of presumed allergic conjunctivitis presented with signs of floppy eyelid syndrome, including easily evertible lids, mucoid discharge, and severe papillary reaction (A). He complained of dry eyes, stinging, discharge, and severe midday fogging with scleral lens wear (B). The goal of management of ocular allergies in scleral lens wear is to minimize symptoms in order to maximize lens tolerance and optimize visual function. Achieving this goal means implementing preventive measures and preparing for acute exacerbations. Following are some steps that can be taken to realize success with scleral lens wear in patients with ocular allergies. Figure 3. Slit-lamp narrow-beam white light photograph of a scleral lens after 4 hours of wear on patient’s left eye with reports of midday fogging and intermittent blurred vision before (A) and after (B) implementing use of viscous filling agent and addition of HydraPEG. Edge lift or loose haptics can allow more rapid influx of debris into the tear reservoir. 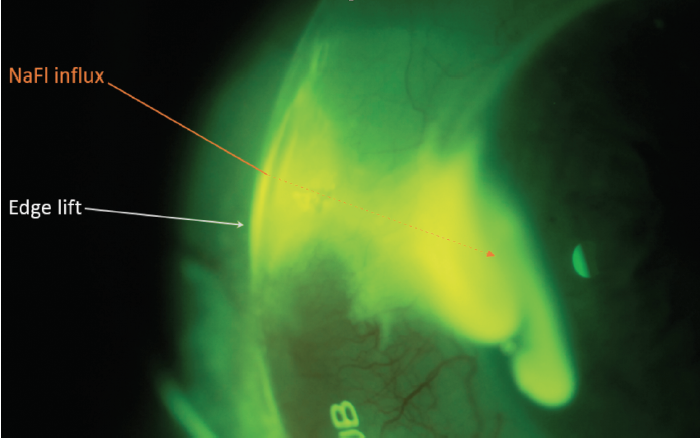 Evaluate for sources of debris influx with fluorescein with the scleral lens in place (Figure 4). Consider using toric peripheral curves to best align the haptics to prevent more rapid onset of MDF. Figure 4. Wide-beam blue light with yellow filter slit-lamp photograph demonstrating rapid influx of debris due to edge lift of peripheral haptic immediately after instillation of fluorescein. Consider using a lens material with lower Dk to maximize front surface wettability. Also consider adding HydraPEG coating (Tangible Science). Recommend re-plasma treatment for lenses every 6 months, or more frequently if needed. Several steps can be taken to optimize lens hygiene. Instruct patients to use a nightly lens cleaner with a rub-and-rinse step to loosen and remove debris. Consider having patients use more abrasive cleaners such as Progent (Menicon) periodically or incorporating the use of a weekly enzymatic cleaner such as Boston One Step Liquid Enzymatic Cleaner (Bausch + Lomb). Preservatives in contact lens solutions and ophthalmic medications are proinflammatory and can exacerbate allergic symptoms.10 Switch all ophthalmic medications to preservative-free formulations whenever the option is available. In general, ophthalmic drops for treatment of glaucoma are proinflammatory and can potentiate ocular allergies.11 Consider altering the patient’s drop regimen to minimize the ocular allergic response. In severe cases, consider alternatives to drops such as laser or microinvasive glaucoma surgery. Dry eyes can increase inflammation and worsen symptoms in patients with ocular allergies.3 Distinguish and treat each condition separately to maximize therapy and minimize symptoms. Applying cold compresses to the eyelids for 5 to 10 minutes at a time, as needed, may relieve some symptoms, especially itching. The instillation of over-the-counter, preservative-free lubricating drops can also provide soothing relief,3 but avoid use of gel drops or drops with oil ingredients with scleral lens wear, as this can cause blur. When you encounter scleral lens wearers with a history of ocular allergies, having a concrete understanding of the patient’s history prior to initiating lens wear, setting appropriate expectations, recognizing patterns of symptoms, analyzing the influence of the lens design and fit, managing concurrent conditions, and closely monitoring results can lead to success for both the scleral lens practitioner and patient. There is much to be learned regarding the influence of scleral lens wear on patients with ocular allergies—and vice versa—the influence of ocular allergies on scleral lens wear. With the upsurge in popularity of scleral lens wear, further studies will undoubtedly unveil more information. 1. Nau CB, Harthan J, Shorter E, et al. Demographic characteristics and prescribing patterns of scleral lens fitters: the SCOPE study. Eye Contact Lens. 2018;44 Suppl 1:S265-S272. 2. Bielory BP, O’Brien TP, Bielory L. Management of seasonal allergic conjunctivitis: guide to therapy. Acta Ophthalmol. 2012;90(5):399-407. 3. Bielory L, Meltzer EO, Nichols KK, Melton R, Thomas RK, Bartlett JD. An algorithm for the management of allergic conjunctivitis. Allergy Asthma Proc. 2013;34(5):408-420. 4. Chigbu DI. The pathophysiology of ocular allergy: a review. Cont Lens Anterior Eye. 2009;32(1):3-15. 5. Tagliaferri A, Love TE, Szczotka-Flynn LB. Risk factors for contact lens-induced papillary conjunctivitis associated with silicone hydrogel contact lens wear. Eye Contact Lens. 2014;40(3):117-122. 6. Kunnen C, Heunen M, Mertz C, Chalmers R, Soeters N. Comparison of white and blue light assessment of the upper and lower palpebral conjunctiva. Cont Lens Anterior Eye. 2018;41(6):473-481. 7. Naderan M, Jahanrad A, Farjadnia M. Prevalence of eyelid laxity and its association with ophthalmic findings and disease severity in patients with keratoconus. Eur J Ophthalmol. 2017;27(6):670-674. 8. Miyamoto C, Santo LCE, Roisman L, Moreno PDAM, Cariello AJ, Osaki MH. Floppy eyelid syndrome: review. Arq Bras de Oftalmol. 2011;74(1):64-66. 9 Walker MK, Bergmanson JP, Miller WL, Marsack JD, Johnson LA. Complications and fitting challenges associated with scleral contact lenses: A review. Cont Lens Anterior Eye. 2016;39(2):88-96. 10. Lievens CW, Kannarr S, Zoota L, Lemp J. Lid papillae improvement with hydrogen peroxide lens care solution use. Optom Vis Sci. 2016;93(8):933-942. 11. Inoue K. Managing adverse effects of glaucoma medications. Clin Ophthalmol. 2014;8:903-913. 12. Wan KH, Chen LJ, Rong SS, Pang CP, Young AL. Topical cyclosporine in the treatment of allergic conjunctivitis: a meta-analysis. Ophthalmology. 2013;120(11):2197-2203.